Perched on a corner, off a very busy Oxford Street, walking into Turtle Bay felt like I was walking into a surf-side cafe after a long day out at the beach. The street shack interiors and reggae beats instantly made me want to whip off my coat and have a dance. With tickets for Gorilla that night me, Mo, the sis and bro-in-law had no time for messing around and instead had to concentrate on the important business of fuelling up. Arriving on time, our table was ready to go and we were kindly taken straight to our seats. Looking around at all the sub-sections and details of the restaurant, there was a lot going on and it was all quite random, but somehow it just… worked? A keen eye for interiors, I know that pulling off casual upcycling in what is essentially a fancy joint, is not an easy task. Exposed pipes, bare bulbs, chipboard walls and a mish mash of materials and colour, turn this space into the perfect venue to eat, drink and have fun with friends. Still struggling to stop myself from dancing, I somehow managed to pull myself together and stay still long enough to decide on a meal choice. A number of my friends come here regularly and constantly brag about the amazing chicken (a strong favourite in any Caribbean restaurant) and their signature ‘rum’ cocktails. This put up a slight challenge as a group of pescetarian-mocktail folk and I was intrigued as to how the rest of the menu might stack up. We picked a range of good looking dishes and I was very excited by the choice of booze-free themed drinks on offer. Usually limited to one or two in most places, Turtle Bay offers around 10 different Caribbean ‘softs.’ Should point out, as ecstatic as I was by this revelation, it did bring on a whole new struggle of choosing which one to have (there’s just no pleasing some people, eh!). Service throughout our meal was brilliant, friendly, helpful and thankfully, very efficient. Waiting for food here is not easy when you’re hungry, as the open plan kitchen grills throw out some seriously orgasmic scents. Our food arrived in good time and it was piping hot in temperature and flavour. For those of us who like things super spicy, there were a number of sauces on the table to add that extra kick. Favourite dish of the night: the shrimp, mango, sweet potato and butternut squash all rolled into a roti wrap was pure genius. It was a strange looking combination on paper but a perfect one on a plate. The Caribbean fish curry also stuck out as a good choice and it was a pretty hefty portion too. There was still room to squeeze in a side of sweet Plantain though. Oh and dessert. Could not leave without dessert! By the time we were getting ready to move on, the place had started to fill up. There were people propping up the stereo brick bar, groups sat in the recycled bus seat booths and everyone looked like they were there for a good time and a long night. With Caribbean cuisine fairly limited in the north-west, there was always going to be a high expectation for my visit here. Luckily, it didn’t fail to disappoint. Not sure whether that was down to the impeccable service, the constant party feeling, the flavoursome food or the ice cold passion fruit cooler I was becoming slightly obsessed with. 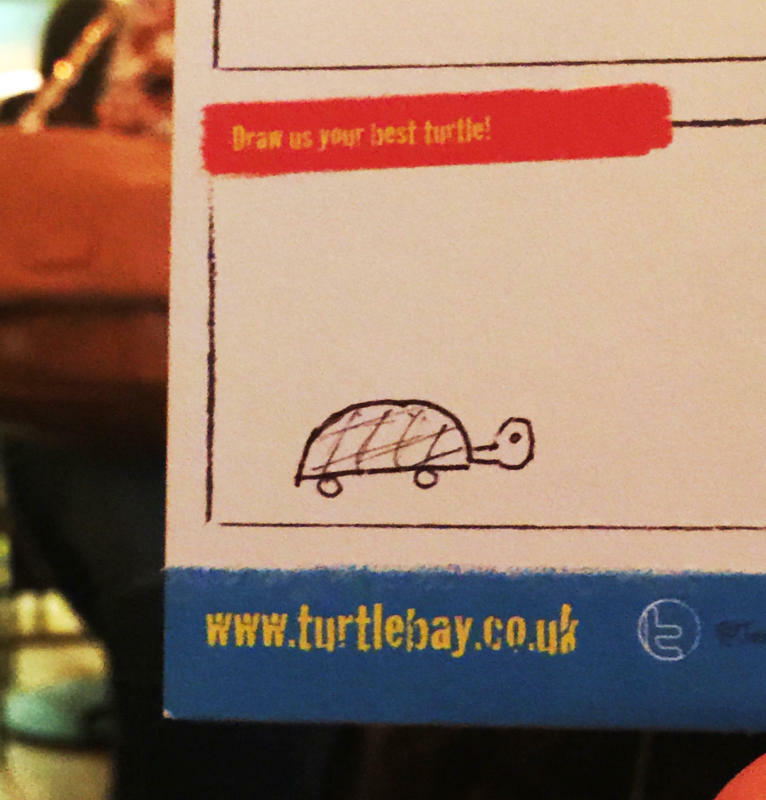 Or maybe it was because at the end of the meal, instead of having to fill out a super long ‘how was your meal’ comment card… they ask you to draw a turtle. You can’t get cooler than that! 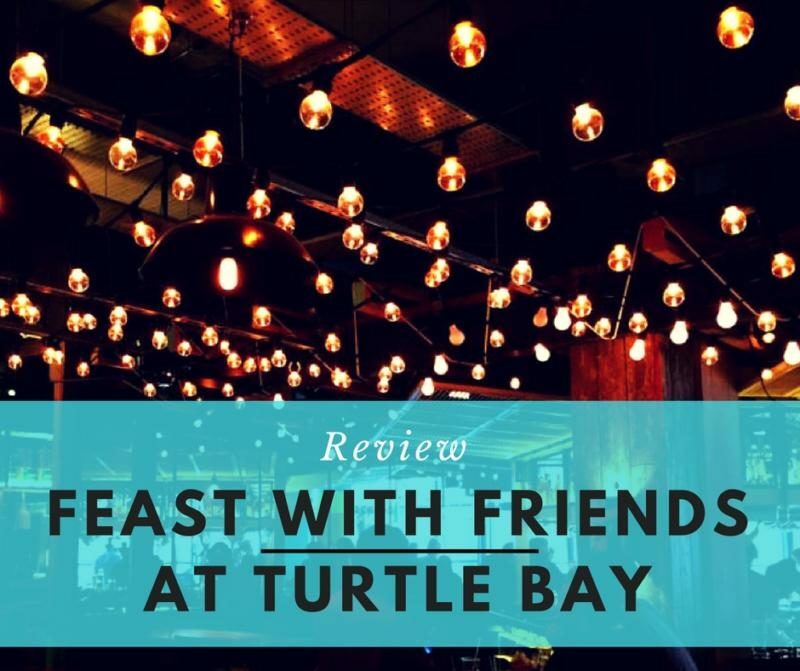 Have you been to Turtle Bay? What did you think?